There is a great lack of quantitative and qualitative data (particularly disaggregated data), research and verified information on the situation of children deprived of liberty. Deprivation of liberty has very negative consequences for the child’s harmonious development and is to be a “measure of last resort and for the shortest appropriate period of time” (United Nations Convention on the Rights of the Child, article 37.b) in cases of criminal detention, and “unaccompanied or separated children should not, as a general rule, be detained”. Children deprived of liberty are exposed to increased risks of abuse, violence, acute social discrimination and denial of their civil, political, economic, social and cultural rights; certain disadvantaged groups are more affected than others; and society is affected at large as deprivation of liberty tends to increase social exclusion, recidivism rates, and public expenditure. The Global Study on Children Deprived of Liberty will shed light on the scale and conditions of children deprived of liberty, identifying good practices and making recommendations for effective measures to prevent human rights violations against children in detention and reduce the number of children deprived of liberty. 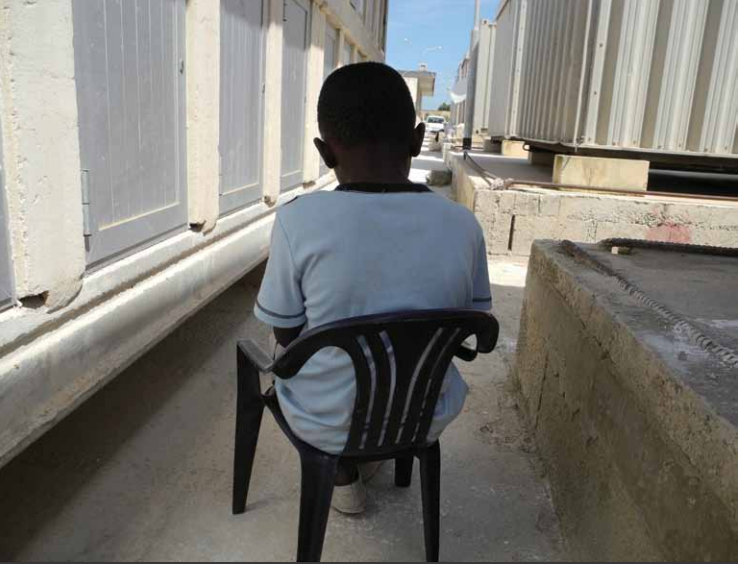 A Ghanaian boy sits in an open center for migrants in Malta. Children with their families, as well as unaccompanied children, are often taken to detention the same day the police apprehend them. Families are typically released more rapidly than unaccompanied migrant children. In order to ensure that deprivation of liberty is clearly understood and thus used as a measure of last resort, there is also critical need to improve the clarity around key concepts which are related to children’s rights and deprivation of liberty (such as last resort, shortest possible time, best interests of the child; access to justice; pre-trial detention; diversion; restorative justice; formal and informal justice systems; alternative measures; protective measures; age of criminal responsibility; rehabilitation and reintegration; administration detention; inter alia). The Study will map out, through monitoring and evaluation analysis, how existing international laws and standards are being implemented on the ground and assess the concrete possibilities for States to improve their policies and responses. Through the collection of sound evidence and reliable data, the Study will also provide a consolidation of good practices and the formulation of recommendations, to support the work of States, UN agencies and other stakeholders to more effectively implement international standards and ensure that children deprived of liberty actually enjoy their human rights. The key output of the Study should be an in-depth, comprehensive global report to be presented to the United Nations General Assembly (UNGA) at its 73rd regular session (2018). Formulate recommendations for action at national, regional and international level to meet international obligations, reduce the number of children deprived of liberty, and put in place effective non-custodial measures.